the Polish Roll of Honour, The Battle Of Arnhem, 1944. It is a tribute to the Polish soldiers and airmen that were killed in Operation Market Garden in September 1944, during the battle of Arnhem. The introduction tells the reader why and how the 1st Polish Independent Parachute Brigade Group was formed and the important part its commander Major-General Stanislaw F. Sosabowski played in this process. These soldiers and officers trained hard for one goal only; the liberation of Poland. In stead they were forced to land near Arnhem and many of them would never see their beloved Poland again. ALL MEN ARE BROTHERS contains the records of the 96 Polish soldiers and airmen that were killed during the battle of Arnhem. Each record is spread on two pages. 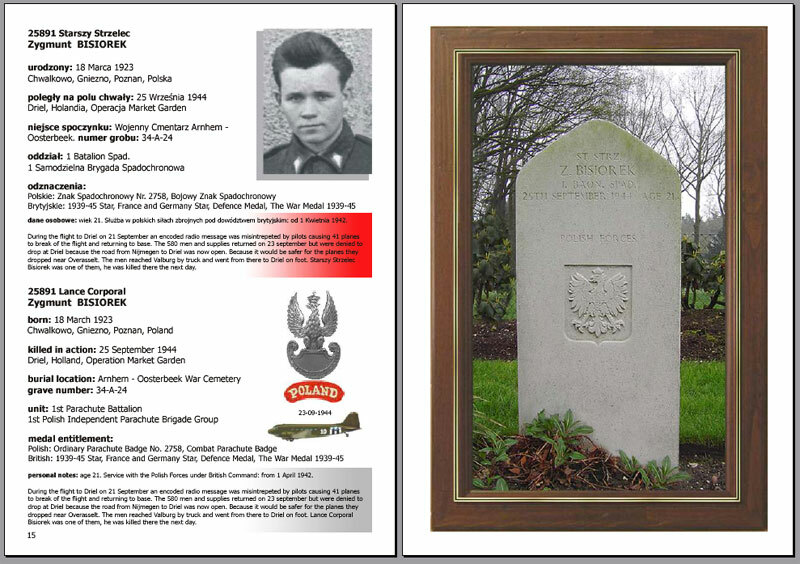 The left page shows a portrait photo and the personal information, the opposite page shows the photo of the gravestone, and information on the cemetery and plot number. For an example see the picture below. ALL MEN ARE BROTHERS is bilingual (Polish and English) and comes in a handy size of 17x24 cm. Further details are the following: 228 pages, full colour, more then 300 unique photos of which most have never been published before. Printed on high quality glossy paper with a strong binding. It will be shipped in a special strong cardboard packing. ALL MEN ARE BROTHERS was presented on September 16th, 2005. During this event, Mr. Michael Sosabowski grandson of, presented the special presentation copies to the Ambassador of the Republic of Poland, the present commander of the Sosabowski Brigade and the President of the Polish Airborne Forces Association. The price is € 22,50 including package and postage in Europe, and € 40,00 outside Europe (USA,Canada). printed by: Royal Press C.C. Callenbach b.v. Nijkerk, Netherlands. On 31 May 2006 the 1st Polish Independent Parachute Brigade received the highest Military Award for bravery and valour from the Netherlands for their actions in September 1944. Major General S.F. Sosabowski posthumously received the second highest award for bravery and valour. With these honours The Netherlands has rehabilitated the Brigade and it's commander after beeing accused of cowardness by both British Field Marshal Montgomery and General Browning. 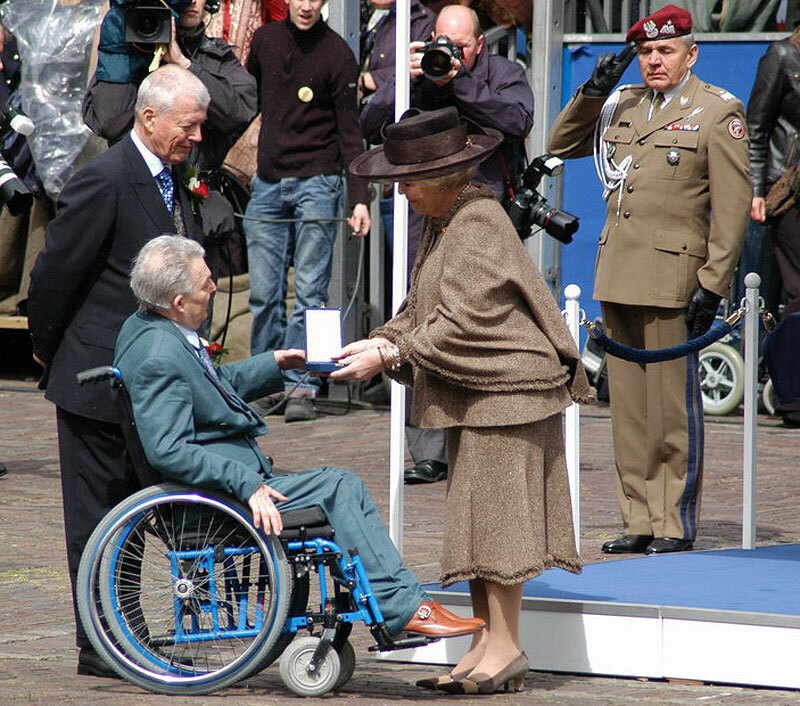 Her Majesty Queen Beatrix of the Netherlands to his grandsons Michael (left) & Stan (right) Sosabowski.